We provide the safest, most reliable, and affordable EVSE on the market. Each meet the rigid testing standards of Underwriter’s Laboratories to earn their UL listing. 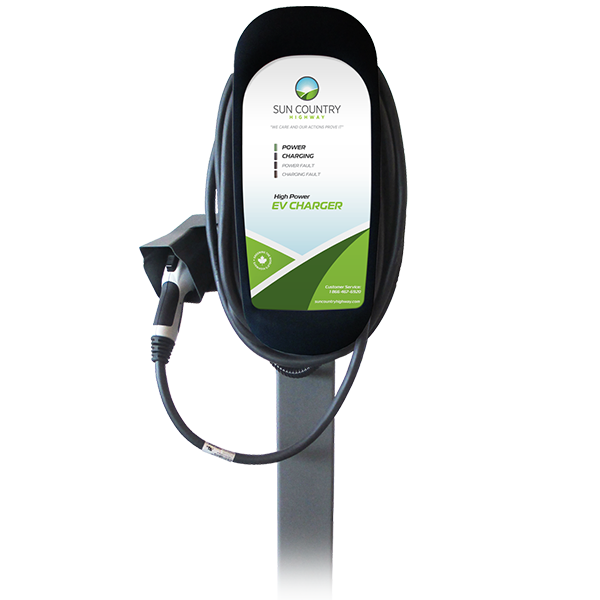 Our charging stations work with all current electric vehicles on the market. Learn the ins-and-outs of each Sun Country charging station including installation, troubleshooting, and warranty with the product brochure or manual. The safest, most reliable EV charging stations on the market. This charger boasts a rugged (NEMA 4) weatherproof casing and easy to read charging panel. Built-in smart re-closure system that self-tests, resets, and ensures your car will be charged in case of power fault or outage. The Universal J1772 connector ensures maximum electric vehicle compatibility. The SCH series is available in 3 powerful options, 100 amp, 60 amp, and 40 amp. Compatible with Liberty keypad for access control solution. Comes complete with 22ft of charging cable. 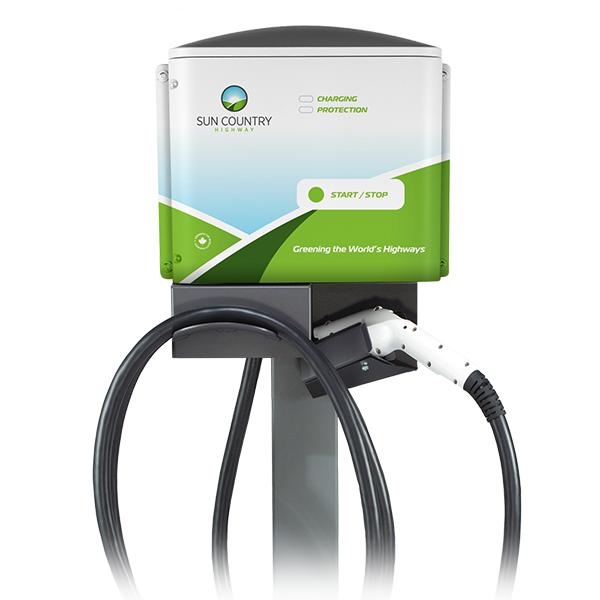 The EV Series is the most versatile and affordable, high power line of chargers from Sun Country Highway. Designed to take the wear-and-tear of everyday use, with a weatherproof NEMA 4 enclosure. Perfect for home or commercial installations with 60A and 40A options. Unit comes complete with 25ft of charging cable. share power supplied by one circuit breaker. When only one EVSE is charging a vehicle, the full charging capacity is available to that vehicle. When both EVSE are charging vehicles, each EVSE will offer 50% of the circuit capacity to each vehicle thus “sharing” the circuit breaker. The EV Series Ruggedized ‘R’ Models - The convenience of the EV Series with a rubber over-molded connector, field-replaceable latch, and a five-year warranty. Solutions for limited power supply installations. These compact chargers offer Level II charging for low-amperage installs. 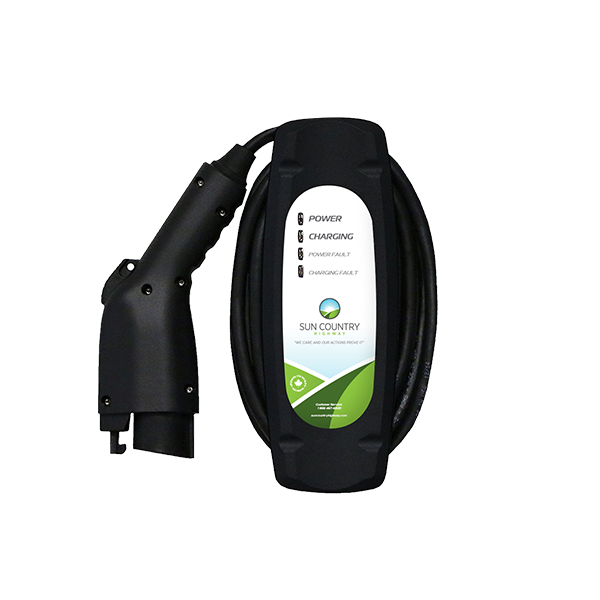 Equipped with the universal J1772 connector, ensuring maximum electric vehicle compatibility. The Compact Charger Series are built and tested to automaker standards to ensure a reliable charge, every time. Units come with 25ft of charging cable. Plug-in ‘P’ Models - Available on both the EV Series and Compact Series these chargers are quipped with NEMA 14-30 or NEMA 14-50 plugs for easy installation and better portability. Low amperage solutions for long-term parking. The Level 1 Series from Sun Country Highway is the ideal solution for low amperage installs. These hardwired 120V units, eliminate the need for a ground fault outlet, providing a more reliable charge. The Level 1 Series provides up to 20 Amps of charging power (2.4kW max). With a fully sealed (NEMA 4) enclosure, the Level 1 series can be installed indoors or out. Charge cord Length, 25 Feet. Ideal for long-term charging situations such as homes, workplaces, airports, hotels, universities, and hospitals.